The brilliance of a print is one of the main features required and appreciated by the market. Comec Italia has developed a range of one and two component inks with particular characteristics of brilliance and clearness due to the high percentage of pigment contained. You can print on any kind of material (in the catalog about 25 different types) with a large variety of colors (about 30 already prepared for each material). If you are looking for a specific nuance, Comec Italia is able to produce PANTONE, RAL, NCS colors on demand through a spectrophotometer, to meet every color need. The ink should be stored in a cool place (temperature between 10 and 25 °C), ventilated, dark, avoiding direct exposure to solar radiation; away from heat and other acidic or alkaline products: you should reserve an area exclusively dedicated to its preservation. The package must be vertical and the lid tightly closed. Once opened, cover the ink with a layer of thinner of the same series to prevent it from drying out or to form a crust. The package must remain open for the shortest possible time. Even the catalysts’ package, which are in most cases hygroscopic and lose effectiveness in contact with moisture, should be stored perfectly closed. The ink must be prepared in containers and with tools clean and in perfect condition, to avoid any contamination. 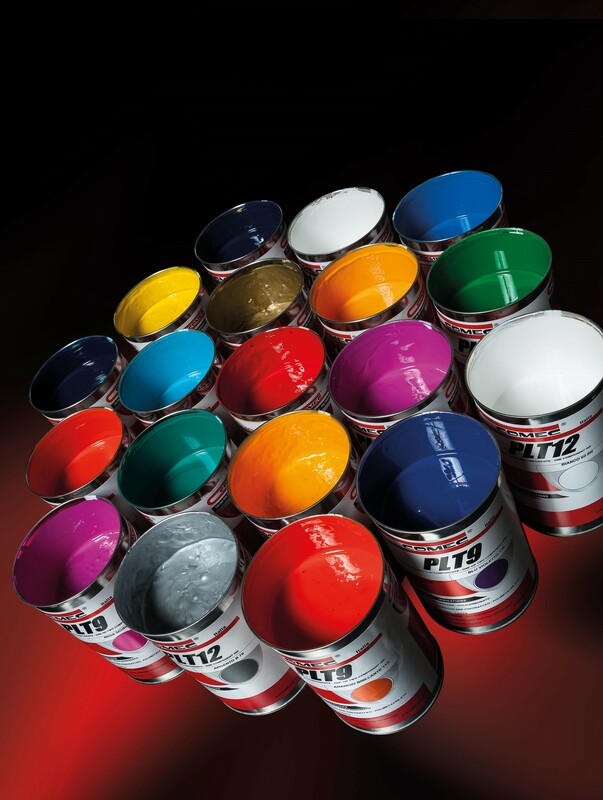 Every time you change the color or type of ink you need to thoroughly clean all parts that have come in contact with it, to avoid any potential incompatibilities that may create several problems. For all other information (security measures, risk prevention and hygiene) see the technical data sheets and safety data sheets of each ink. ON WHICH MATERIAL DO YOU WANT TO PRINT? Look for it in the drop down menu below, you will find a suggestion of the most suitable inks!